Our mission is to pro-actively impact the community by assisting others in need while improving their quality of life through our members service, teamwork, knowledge, experience, and financial resources. 1. Service: Provide meaningful altruistic service building a better community that is important to the members of the club as well as the individual recipients and organizations. 2. Knowledge: Extend our shared knowledge, experience, and expertise in the support of individuals and organizations in the community. 3. Integrity: Maintain high standards of conduct, honesty and reliability at all times. 4. Trust: Through proven integrity of our actions and deeds we seek to earn and maintain the trust of the community. 5. Financial Resources: Establish fundraising activities to raise monies for distribution to a variety of approved and budgeted service projects. 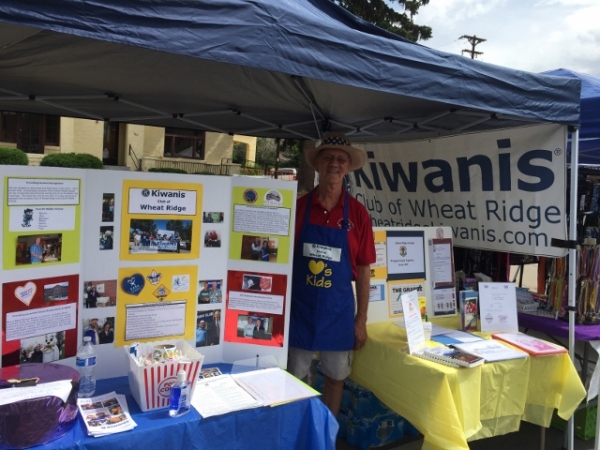 Wheat Ridge Kiwanis has an annual fundraiser in September at the English Conclave selling breakfast burritos, the best hot dogs and delicious mouth-watering brats. We have an annual garage sale to raise funds. Any donations to the sale are gladly accepted.